Yes, I’ve never seen any Rocky movie. Or maybe I’ve seen them all, thanks to spoofs, parodies, homages, reference clips, and a handful of “underdog solo athlete” genre movies that I have seen. But that just proves the cultural relevance of the film and why I should be seeing it. The story of Stallone’s million to one shot of getting this made was more interesting to me than a David and Goliath story about a boxer. There’s probably a documentary or biopic about that out there. Rocky Balboa is a boxer circling the bottom of the barrel in Philadelphia. He’s a decent fighter, but he’s in such a small club that to pay the bills, he breaks thumbs for a loan shark. His best friend Paulie is overbearing, but Rocky is enamored with Paulie’s shy sister Adrian. When one of heavyweight champion Apollo Creed’s planned bouts is cancelled, he decides to find a nobody to box in a show fight commemorating America’s bicentennial. Creed picks Rocky as an easy win, but Rocky takes the “chance for a nobody to become a Somebody” rhetoric to heart and puts everything he’s got into getting ready for the fight. The sudden fame and attention threatens to tear apart his personal relationships, but proving himself in the ring is all that matters. This is a slow. burn. Boxing provides context and direction, but the real point here is to paint a portrait of life as a penniless nobody in Philadelphia. Creed doesn’t enter the picture until almost a quarter of the way into it, and still until the fight at the end he’s more off in the distance than a real presence. There’s an occasional training montage, but fist work seems to be a pretty small part of the training regimen for boxing. The Rocky and Adrian relationship seems like it wants to be a major part of the story, but it doesn’t seem to have an arc. She’s a quiet, spooked girl hiding behind a pair of glasses and as many layers of clothes as she can get away with, her brother pushes her out on a date with Rocky, Rocky pushes her way beyond her comfort zone on the date, her glasses come off, and then she’s suddenly a normal person in a comfortable, steady relationship with Rocky, story-wise more a mechanic of Rocky’s relationship with Paulie than a romantic interest. She serves as an anchor in his changing life past that point more than anything. There’s a hint of conflict when Rocky’s manager tells him to forget about girls while in training, but nothing seems to come of that. The end was actually happier than I was led to believe. I’d heard that he loses, but he doesn’t. It’s not 100% clear what the ultimate result of the fight is, but it’s better than the loss I was expecting. The Veggie Tales spoof didn’t change as much of the story as I thought. What really sells this movie is Bill Conti’s score. 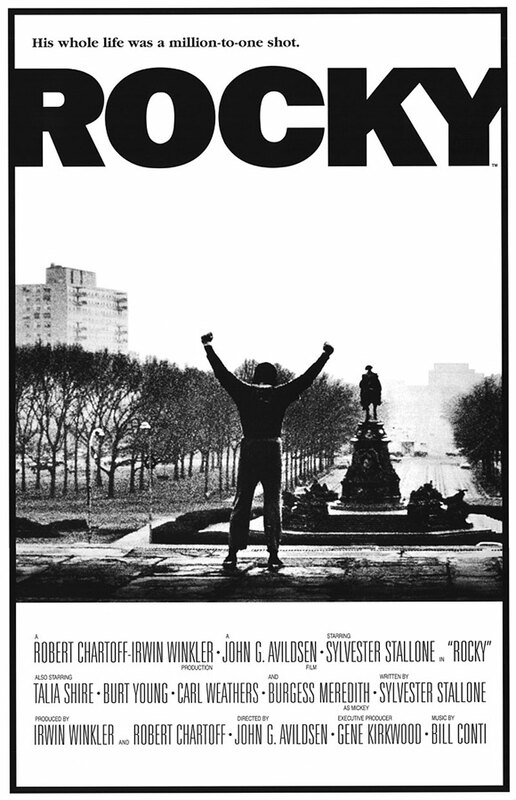 I have no idea how such an unlikely movie got such good music, but Rocky’s Theme in all forms is richly orchestrated, and by the end it’s been pushed farther into glory than may have been imagined any time but the Disco 70s. This is incredibly important for the three or four montages that seem to be all anyone cares about from this film. This gets sold as a boxing movie, and it really isn’t. Maybe the endless, increasingly commercial sequels fixed that, but this is a human story. The kind that has moments of interest but is important for the space between them. It’s not epic, it’s not inspiring, it’s not cool, it’s just artistic. It’s too bad Stallone became an action star when he has things like this in him as a writer.